Can you multiply using the grid method, or draw a multiplication calculation as arrays? Find out more about multiplication and how it’s taught in schools today with our teachers' tips, tricks and methods, explained for primary-school parents. 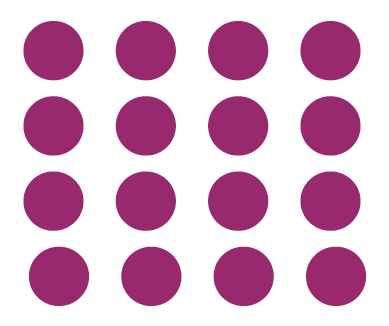 In KS1 your child will be introduced to multiplication; it's taught as repeated addition and your child might talk about arrays and tell you that they've been counting and drawing dots in maths. This shows the children what four lots of 4 really looks like. They can count in 4s, or to begin with just count all of the items, to get the answer. As well as drawing arrays to help with multiplication calculations, they can also do multiplication as repeated addition using a number line. For example, if the calculation is 3 x 4 they could start on zero and make leaps of 3 four times to get to their answer. Children will learn that, unlike division, multiplication can be done in any order; the result will be the same. It’s a good idea to suggest that it may sometimes be easier to flip the calculation around. For example, if the calculation is 5 x 9, they might find it easier written as 9 x 5 because they'll be used to counting in 5s. Learning times tables is considered as important as ever, although some schools put more of a focus on learning them by rote than others. Children should go into Year 5 completely confident in all their times tables. No matter how tedious your child finds times tables practice, it's worth it in the long term, so persevere! In Key Stage 1, children learn to count in 2s, 5s and 10s. They may do this using a number line or a 100-number square. You can help them at home by printing out a hundred number square and encouraging them to count in 2s, pointing to each number as they go along. They could colour in all the multiples of two and then put the number square up somewhere they will see if every day. Once they have got the hang of counting in a certain number, give them activities during everyday activities, for example: when you are driving to school, encourage them to count in 5s all the way along a certain road. When you turn a corner, ask them to count in 10s along the next road. Once they've mastered counting in sequences children learn the 2, 5 and 10 times table and they should be confident with these by the end of Year 2. Make sure you test them as often as you can, but only for short bursts at a time; little and often is better than long sessions learning tables which will bore and tire them (and you!) out. In Year 3, children learn their 3, 4 and 8 times tables. By the end of Year 4, they should know all their tables up to 12x12. As with most areas of primary maths today, story problems play a part in the teaching of multiplication. Every day at lunch Jayden has 5 grapes in his lunch box. How many grapes does he eat at school during the week? Here the children would have to consider that there are 5 days in the school week and there are 5 grapes each day. Therefore the calculation must be: 5 x 5 =. They could then draw an array of 5 lots of 5 grapes and count in 5s (or count each grape if needed) to get to the answer. A hat costs £4 and a scarf costs £2. Josie buys 4 hats and 6 scarfs. How much money does she spend altogether? Here they have to think of two separate multiplication calculations and work out that, once completed, the answers need to be added together. It is really important to get your child used to the various different words associated with multiplication. Vocabulary related to multiplication includes: lots of, groups of, times, multiply, multiplication, multiplied by, multiple of, factor, product, once, twice, three times etc., times by, repeated addition, array, row, column and double. What is 8 multiplied by 9? Give me three multiples of 5. At school children will be encouraged to use multiplication in different areas of maths (space and shape, for example, or money maths). It might take a while to get the hang of these (and other related) facts, but once they know them off by heart, they will find problem-solving involving measures much easier. In Key Stage 2 one of the new multiplication methods taught is known as the grid method. In Year 3, children will learn to multiply a two-digit number by a one-digit number. They may learn this using the grid method. In Year 4 they need to multiply two-digit and three-digit numbers by a one-digit number. In Years 5 and 6 they need to learn to multiply numbers of up to four digits by a two-digit number using long multiplication. To solve complex word problems, often with two or three steps, sometimes using a calculator. What is 2/8 of 104? The area of a rectangle is 36cm². What could its width and length be? I have 5 cups. I put 450ml of water into each one. How much water have I poured out in litres?